Posted by Named after the waterfront district in San Francisco, Embarcadero means "wharf" or "landing place" in Spanish. 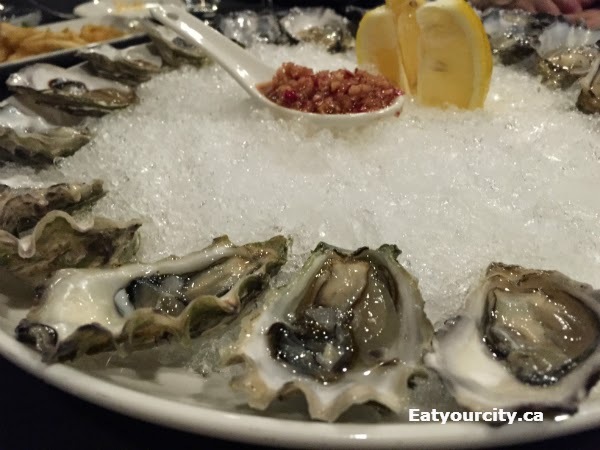 Known for the widest selection of oysters in the city, they boast at least six varieties of northern Atlantic and Pacific fresh oysters on the half shell... on the night we went, there was 15 delicious varieties to try! The cuisine is an interesting blend of Spanish, French, Italian and Asian influences, which was surprising as Chef Arthur magically manages to add in touches of each without muddling and elevate the menu items to a new level. On to the food! Can't visit a oyster bar without trying out some oysters! 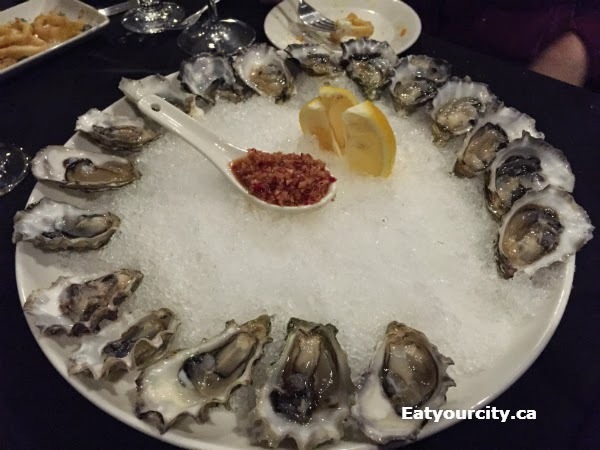 We had the Inoui oysters from Baynes Sound, BC. Small ultra sweet little oyster with a clean briney finish. They were served with a variety of sauces... we loved the Chef's creation which was a combination of garlic, soy, sesame oil and other tasty stuff I've forgotten, as well as Embarcadero's homemade hot sauce which has a touch of bright sweetness from fresh citrus. Nom! 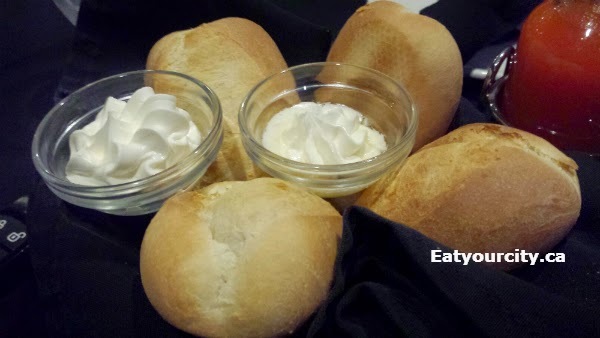 Freshly baked buns with ethereally light whipped butter was quickly devoured... yum! The Calamari was lightly battered and deep fried to a perfect toothsome bite. It was served with tzatziki and lemon wedges, but it was seasoned enough that it stood well on its own. The Arancini, crisp deep fried herb roasted mushroom risotto balls stuffed with asiago and served with a mellow oven roasted tomato garlic aioli to dip in. Yum! Our large group ordered the same dishes all around - duck, salmon and ribs.. great minds think alike lol! The Crispy skin Brome lake duck confit in a red wine jus with garlic smashed potatos and seasonal vegetables was the entree me and several others ordered. The duck skin was nicely crispy, the meat moist and nicely seasoned, though a quick brine prior to pan searing would make the Brome lack duck breast a lot more tender. It was surprisingly cut into two large chunks.. slicing diagonally as its usually served in other restaurants would make the serving look bigger as well as more visually appealing. The garlic smashed potatoes were great with a good amount of buttery potato goodness mixed in with a healthy smash of sauteed garlic, and there was a good sized serving of tasty roasted seasonal veges - yellow beets, broccolini, cherry tomatoes. Lots of our group, fiancé included, had the Garlic butter pan seared salmon fillet, prawns, and vegetables on a bed of butter garlic rice. A huge slab of salmon is simply and beautifully pan seared in butter for a crisp crust and melt in your mouth tender moist salmon. The prawns are nicely done and toothsome, while the rice seasoned lightly with butter, sauteed garlic and fresh parsely was a nice side along with roasted seasonal veges. The Braised BBQ baby back ribs were a hit, as many of us nabbed ribs to "quality control taste". The ribs were braised in a sticky rich lick your fingers sauce with hints of molasses and spice. The meat was just short of fall off the bone tender and disappeared like magic. We were all too full to fit in dessert as we had all cleaned our plates. Overall, a great cozy spot (we were sitting up on second floor - they have a main floor dining room too) for delicious oysters and fusion fare.